It’s a fact: If you’re going to see results with a project or task, then you have to invest time preparing for the main event. It is critical to learn best practices, study the masters, research your audience, and understand their potential problems before you take action on anything. These steps are synonymous with some of my favorite things: copywriting, marketing, coaching, and scuba diving. Isn’t it ironic that these activities require a significant amount of risk-taking and due diligence to produce desired outcomes?! Neither are there guarantees with things like business, writing, marketing, or scuba diving. But without taking risks, none of us will ever achieve results. Without [insert activity], you will never experience [insert proposed results of action]. The formula is the same no matter what you put in the blanks. Without diving into the ocean, you’ll never experience the nirvana of a magical underwater adventure. Similarly, without hiring an experienced communicator to write compelling, direct response content— you will never connect with your customers. If risk-taking is a part of life and business, then why are so many people fearful of stepping out and taking risks? I know, I know… everyone wants a guarantee. But the fact is — there are no guarantees in life. Oh wait, I have one, but you won’t like it: If you keep sitting on the couch eating sweets - I guarantee you’ll get fat. But that example doesn’t represent the positive results the vast majority of us are seeking in business and life. While there are no guarantees in life, did you know that scuba diving is considered a low-risk sport with approximately 2 deaths per 100,000 divers? Similarly, there are no guarantees with most things in life or business. Many business owners and entrepreneurs search for someone that will provide them guarantees on conversion rates and ROI. But any solid communicator will tell you they cannot predict the future. The only thing they will promise is deeply educated guesswork. It is impossible for any professional communicator to guarantee success because there are so many factors outside of a writers’ control. From timing to design to distribution to the product itself to a worn-out list… the factors that can and will influence results are endless. Life and business involves pursuing outcomes by taking calculated risks. Since there aren’t any guarantees—how do you make wise business-related decisions such as hiring a copywriter, marketer, or coach? Just like I would never go diving without planning and preparation, I don’t recommend you hire someone until you’ve checked their skills and credentials. You need to find out if they know what they are doing. Comparatively, before I dive with a dive shop or operation, I check to see if they have received a 5-Star PADI rating. I recommend you do the same thing and check the creds of any copywriter, marketer, or coach you’re considering hiring. Just because they talk a big game, how do you know they are worth their weight in salt? But when you dig into their background, you learn they don’t have the genuine know-how; they are just a good salesperson. Since gaining understanding starts with a conversation, ask key questions about their service and process. Discuss the projects they’ve worked on, and the results of their work. How many years have you been working as a copywriter and marketer? How do you strive for excellence and professional growth? Do you have endorsements and certifications to show you’re continually leveling up? I’ve been a copywriter, marketer, and coach for more than 20 years. In the last five years, I’ve pivoted from a focus on SaaS-based companies to entrepreneurs and business owners. Will I guarantee results? Absolutely not. 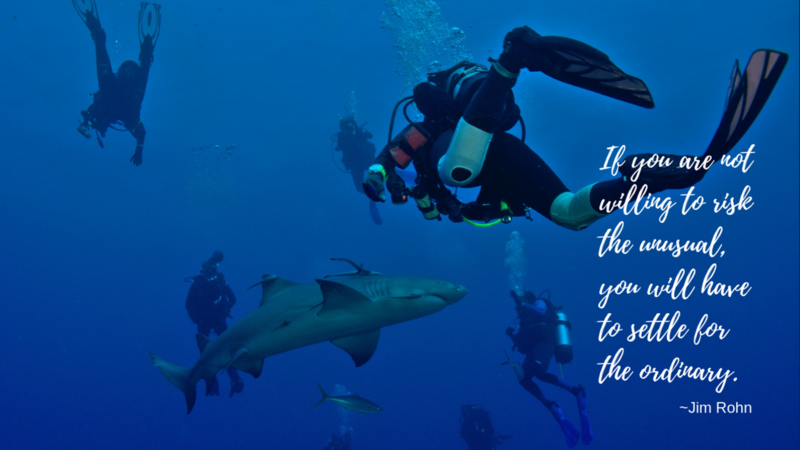 But you can bet, I will dive deep into creating success for your business with the enthusiasm of someone who takes risks and is passionate about diving with sharks, and with the integrity of one who follows a true moral compass. The decision is yours. You can do nothing because you want guarantees. Or as Chuck Yeager said, "You don’t concentrate on risks. You concentrate on results. No risk is too great to prevent the necessary job from getting done." Click this link to start our conversation about your copywriting, marketing, and coaching needs.